Not much to say today. Autumn again. Summer ended suddenly. Weather is brilliant, but butterflies gone. I think they probably couldn't survive colder and colder nights. Or maybe their favourite flowers gone, too and butterflies died from starvation? I don't know, needless to say, I saw only few of these colorfull insects last times. Mainly our brightest star - Peacock. In my favourite area of Botanic Garden, in area with many different flowers, few Echinaceas survive. Peacock and Echinacea are the best friend. This time was no exception - I saw few of Inachis io flying from flower to flower. Autumn nostalgia. I took few pictures, quick. Postcards from last days of light and warmth, gems ready for long Polish winter. Great composition and colour tone. The colours make for a very interesting image. Very well done! Yes, the summer reached the end indeed and our subjects getting decreased everyday :(, time for the mushrooms :-) This peacocks look really wonderful hope that i meet one of them next spring. i like the colours and lighting, the moody is appropriate to the summer ending. Lovely dynamic deep color and I like the low key exposure, it works well for this "End of Butterflies" season capture.. Very touching farewell to summer, Greg. The Peacock sits poised to fly into the abyss of life's cycle and to emerge again into the spring or summer of the next season. A beautifully composed image with lovely colours, shades and tones. Nice close up, really detailed and colorfull. Hey Greg - what a fantastic shot! Brilliant colours, lighting and very nice bg! Excellent POV, sharpness and composition too. I like your picture very much. Thank you my friend. Bella... muy bella macro, principalmente por la composici�n, que incluye no s�lo la mariposa, sino tambi�n una maravillosa flor y un perfecto fondo. Excelente POV con gran agudeza y un colorido suave, que brinda un efecto de intimidad del insecto en su entorno. Qu� apertura utilizaste para esta captura? Nice... very nice macro, mainly for the composition, that it not only includes the butterfly, but also a wonderful flower and a perfect bottom. Excellent POV with great sharpness and soft coloring that it offers an effect of intimacy of the insect in their environment. What aperture did you use for this capture?. at the end of summer this beautiful arrangement. 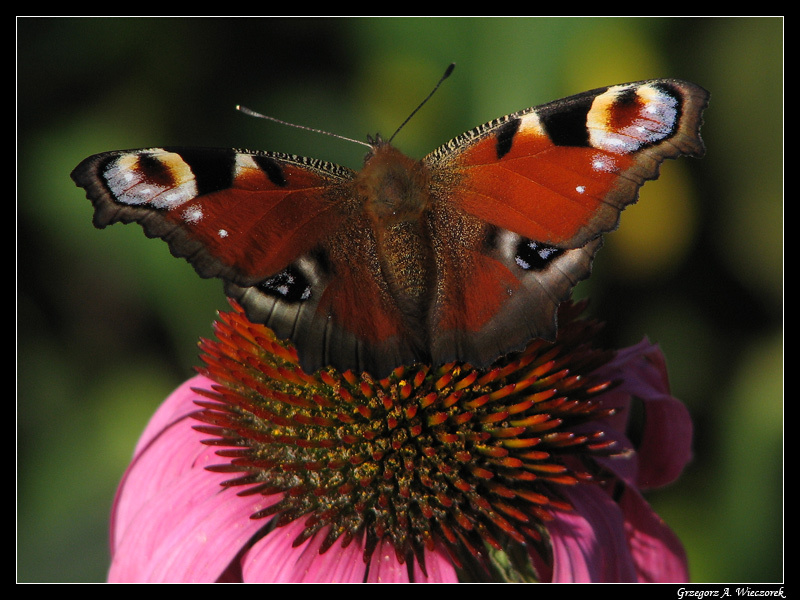 It's one of the most wonderful butterflies and I also love the echinacea so much. Yes, today it is farewell to summer here too, and the only butterflies left around here are one or two Red Admirals and the odd Small Tortoise-shell but they are rather worn by now. I'm amazed that you've found such a fresh-looking specimen of the Peacock - Really brilliant shot, dead sharp and wonderful darkish colours. Lovely colors, background and light. A good representation of the weather change. Wonderful close up.POV,colors,BG,framing and composition are excellent. While you people in the northern hemisphere slowly start to unpack the warm clothes and thick blankets in preparation of the coming winter, we here in the southern hemisphere are checking the air conditioners and fans to ensure all is working well to provide some needed escape from the scorching heat to come. So, your butterflies such as the beautiful specimen in your photo disappear while I'm getting prepared for another season of running and chasing exercises trying to capture one of these illusive flitters. You presented this lovely peacock on the stunning flower in a very striking composition with excellent natural colours be it somewhat on the darkish side. The OOF BG compliments the insect rather well, the details are crispy, and the exposure was well managed. Good work my friend and TFS. Wonderful shot, great POV and the composition is excellent, the details are lovely and sharp but I think what really makes the shot so good are the beautiful Autumn colours that you have captured. je ne sais pas si c'est le meme que celui que j'avais publi� il y a quelques temps,mais le mien n'avait psa les ailes ouverte comme ici. Its hard to believe your summer is over, ours is about to begin. Already we have had bushfires with homes and lives lost. I fear it may be a long hot summer. Splendid composition with this lovely butterfly! The low light really brings out the best of him! Perfect focus, impecable DOF, excellent POV and very beautiful colors. This is a splendid shot ! I love everything on this picture, the compositionm, POV, colors, DOF... You also have excellent sharpness and details, and your nots is very beautiful... So sad to think that butterflies have disappeared... The summer is passing much too fast ! :-) Very well done ! This old photo of You was featured on the main page today, and I of course didn't pass it through, on my "Peacock day" (I commented a lot of photos today dealing with this beautiful insect). Great shot, although I feel it's a little underexposed - not brutally, but more than the optimal (to my personal taste, of course - although I myself use UE very usually, most of all if I shoot with a compact camera. On this photo I feel it a bit too much). Made a WS, I hope You don't mind. I give my 2 points, because everything else is fantastic on the pic, except for the mentioned UE. Interesting note also - I was a bit surprised to read "peacock and Echinacea are the best friends". There's a few of this flower in my parents' garden, but I don't remember I ever saw peacock on them. I'll ask my father today about this. Thank You for the information, and of course for the pic.